Diseñado sobre la base del tanque Christie M1931 y producido en la planta de locomotoras Jarkov Komintern (KhPZ). 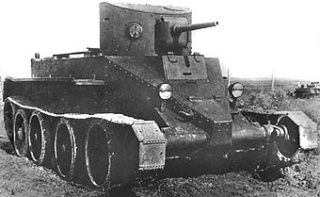 650 tanques BT-2 y 1884 BT-5 se produjeron desde 1932 hasta 1935. Long and low to the ground, it is as sleek and fast as it looks. While the BT-2 is extremely fast and has a decent selection of guns, its armor is paper thin. In the first few tiers this is not such a huge drawback, but as firepower increases, it is vital to get into good habits for light tanking early. The first lesson is to keep moving and use cover as much as possible. Long charges across open terrain are suicide, no matter what speed you're going. Instead, dash between all available cover, use your agility to throw in some evasive maneuvers, and above all, keep your speed high. If BT-2 is used correctly, then it can achieve record-breaking kill and damage records as compared to other recruit match tanks. It's relatively powerful, even with the thin armor. 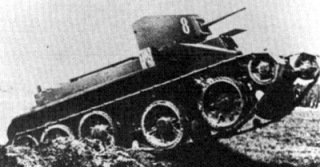 While the German tier 2 light tanks are more general purpose in nature, the Soviet BT-2 was designed for speed. With this tank you will begin learning tactics that will apply to all light tanks at higher tiers. In combat, you want to attack enemy flanks, preferably while they're busy fighting one of your allies. Use your speed to get in fast and then get out again. This is a great way to take out enemy artillery. The BT-2 provides a great platform for getting the auto-cannon into range fast where it's the most effective. Once more or less fully upgraded, the 45 mm 20K and 37 mm ZiS-19 are also good weapons at this tier. This tank also serves well in a scouting role, but the limited signal range can be an issue if there are no friendlies between you and the main group to relay your signal. Another possible use for the BT-2 that is overlooked by other players is its ability to be a sniper and support tank. The BT-2 offers a very high penetration gun that can wreck tier 2's and 3's alike, and given its small size and fast speed the tank is allowed to reach these positions quickly and efficiently. Once the enemy team has been greatly weakened, you can then go ahead and take the task of an assault tank, wiping out any stragglers and erasing the enemy team from the map. The only thing that carries over from the MS-1 is the 23 mm VJa auto-cannon. It's an upgrade worthy of immediate installation. The upgraded suspension is a good place to start researching, as it adds 4 deg/s to traverse speed. Next upgrade engine and the turret in either order. 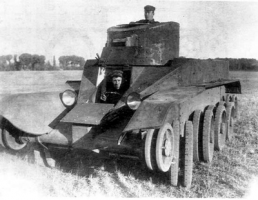 BT tanks saw service in the Spanish Civil War, Battle of Khalkhin Gol (Nomonhan), the Winter War in Finland, the Polish campaign, and in the entire World War II. They first saw action in the Spanish Civil War. A battalion of BT-5s fought on the Republican side, and their 45 mm guns could easily knock out the opposing German and Italian light tanks.